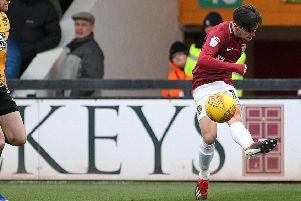 The Cobblers will have two home games in the EFL Checkatrade Trophy group stage - but must travel to derby rivals Peterborough United. After Town being drawn in the same section as Posh and Cambridge United last week, the Southern Group H group details were finalised on Wednesday with Southampton Under-21s added to the group. The Saints youngsters and Cambridge will both visit Sixields for group games, but Town will have to travel to London Road for their third fixture. The provision fixture dates see the Cobblers hosting Cambridge in the week commencing August 28, before travelling to Peterborough in the week commencing October 2 for what will be the second clash between the sides of the season. They meet in Sky Bet League One at Sixfields on August 26. The Checkatrade group stage will then be completed with a visit from Southampton Under-21s in the week commencing November 6. Full match dates and details will be confirmed in due course.